Engaging in Social Partnerships helps practitioners advance democratic engagement by creating spaces where institutions of higher education, community groups, and other organizations can come together. This important book prepares higher education professionals to become reflective practitioners while working in collaborations that span not only the boundaries of organizations, but also borders created by the social divides of class, race, ethnicity, culture, professional expertise, and power. Through illustrative cases, Keith explores effective models of democratic engagement for university-community partnerships, as well as approaches to overcoming obstacles and assessing process and outcome. Current and future professionals in higher education will find this a valuable resource as they explore the power of engaging in collaborations that cross social divides, while enacting practices that are more equitable and democratic. "With compelling depth and clarity, Engaging Social Partnership offers an exemplary read on the theory and practice of university-community partnerships. Keith insightfully positions the process of partnerships at the center of democratically informed collaborative practice and principles. By providing careful and judicious analysis based on convincing evidence, Keith challenges readers to critically engage in the power, pitfalls, and promise of higher education and community partnerships." 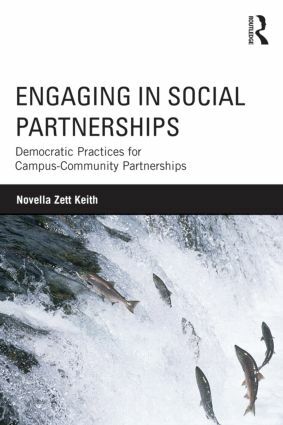 "Keith offers a practical guide for academics interested in engaging communities in a way that moves beyond a framework of ‘service’ to one of democratic partnerships committed to a more just world. Through insightful case studies she demonstrates the radical possibilities of university-community collaborations to build collective knowledge, transform relationships, and destabilize structural inequalities. This is a thoughtful and important contribution to the field." "Engaging in Social Partnerships is not just another book about partnerships. It is a book about higher education engagement with a defining theme of democratic practices that advance the public good." Preface. Part 1. Contexts. 1. Social Partnerships across Social Divides.2. Different Lenses for Understanding Partnerships: Learning from the Addams-Lincoln Family Center Case. 3. Democratic Engagement in Higher Education: Between Modernity and Neoliberalism. Part 2. Thinking about Professional Practice. 4. Crossing Borders: From Experts to Democratic-Civic Professionals. 5. Toward Wise Practice for University-Community Collaborations. Part 3. Learning about Professional Practice through Cases. 6. From Normal to Wis(er) Practice in a High-School, Community and University Service-Learning Partnership. By Novella Keith with Fatima Hafiz and Jim Peterson. 7. Building Trust, Sharing Power, Crossing Borders: The Art Sanctuary-Temple/Tyler Partnership. By Billy Yalowitz, Karen Malandra, and Novella Keith. 8. Cultivating Civic Capacity for Democratic Collaboration: The Maville-TST Project for School Success. Part 4. Going Forward. 9. Looking Backwards to Go Forward. Conclusion. Novella Zett Keith is Professor Emerita of Urban Education at Temple University.